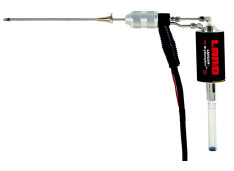 probes suitable for a wide range of applications. Suitable for most applications where the flue gas temperature is below 600 °C / 1112 °F. °C / 1112 °F and 2552 °F. For measuring smoke density simultaneously with flue gas analysis. For measuring the sample gas flow rate, and calculating mass emissions levels. A revolutionary design to dry the flue gas at the sample point. Patent pending. tip, and an adjustable collar to control insertion length. proven pitot design for high accuracy. incorporating a revolutionary design (patent pending).